Traditionally martial arts in Japan are passed on from teacher to student by direct transmission. 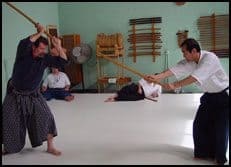 The origins of Nami ryu are in Yanagi ryu Aiki Bugei, the martial traditions of the Yoshida clan of the Satsuma region of Kyushu, Japan. Yoshida Kotaro was thus a gifted martial artist who was well known in pre- and postwar Japan. He was an associate of many of the most important people in Japanese martial traditions of the 20th century, both old and new. Yoshida Kotaro was involved with Takeda Sokaku, who brought classical Samurai martial traditions into the 20th century. He was also directly instrumental in Ueshibia Morihei, the founder of Aikido, meeting and training with Takeda Sensei. This knowledge that Ueshiba gained from Takeda Sokaku was the foundation of his development of Aikido as a major modern martial art. We have no known record of Yoshida Sensei passing on his family art to anyone in Japan. The only person that we know of who had knowledge of these family traditions, however, was his son Yoshida Kenji, who came to the United States prior to the Second World War. Yoshida Kenji Sensei, having no relatives in the United States and no contact with Japan, taught and passed his art on to Don Angier. Don Angier Sensei has dedicated his life to the study of Yanagi ryu, which was the family art of the Yoshida clan. Angier Sensei passed away in October, 2014. James Williams Sensei was a student of Angier Sensei for many years. James Williams is the President of Bugei Trading Company, Inc. He has been studying martial arts since 1960 and teaching since 1975.James has trained, competed in, and taught a number of different martial disciplines: Japanese, Okinawan, Chinese, Filippino, as well as the Brazilian system of Jujitsu as taught by Rorion and Royce Gracie. His experience includes western wrestling, which he also coached, as well as competing in boxing and kickboxing. 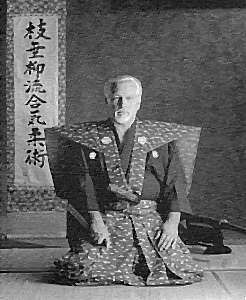 His love of samurai martial traditions came with his study of the Yanagi ryu of the Yoshida han under Don Angier Sensei and the martial traditions of the Kuroda-han as taught by Kuroda Tetsuzan Sensei. James also studied Daito ryu Roppokai with Okamoto Seigo Sensei. James teaches Close Quarters Combat to police and military both foreign and domestic. The method used, “The System of Strategy,” is based on those skills developed and cultivated by ancient warriors. He is the designer of tactical flashlights and knives, including the “Hissatsu,” a close quarter battle knife that is produced by Columbia River Knife and Tool. James is certified as an instructor of Systema (an ancient Russian Martial Art) by Mikhail Ryabko and Vladimir Vasiliev. 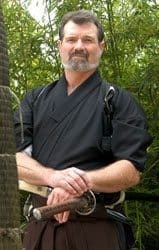 Williams Sensei teaches Nami Ryu Aiki Heiho, (kenjutsu, iaijutsu, tanto jutsu and aikijujutsu) and The System of Strategy in Encinitas, California. Kuroda Tetsuzan Sensei of the Shinbukan Kuroda Dojo, is the Soke (familial inheritor) of several ancient Samurai military disciplines. Kuroda sensei inherited this knowledge through his family line and is the headmaster of the Kuroda family martial legacy. Kuroda Sensei began his training at the age of 5 and was trained by both his father and his grandfather Kuroda Yasuji. Komagawa Kaishin ryu kenjutsu was founded by Komagawa Tarouzaemon-kunikichi. Kaishin is composed of two words, kai and shin. Kai means change and shin means mind or spirit. Kaishin means changed mind or spirit. This style of kenjutsu was founded 450 years ago. “In the absence of the warrior-protector, the only way that a government can protect a society is to remove the freedom of its people. And in such a society, the sons and daughters of Lions become sheep”.